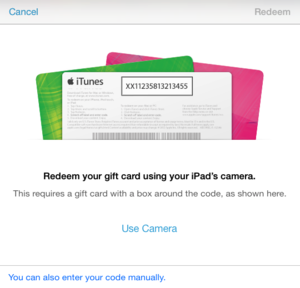 Though both the iTunes and App Store have significantly updated design schemes, both apps are functionally almost identical to their iOS 6 counterparts. 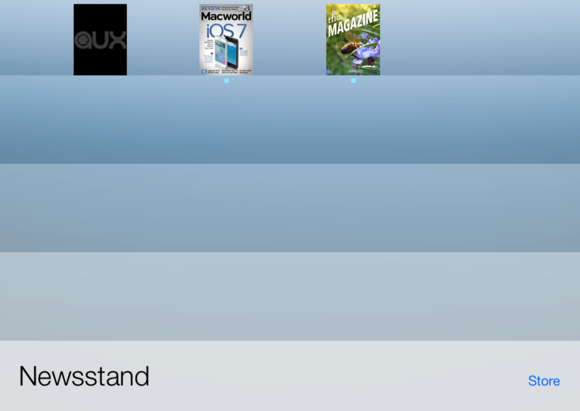 Newsstand, meanwhile, gets a new look and the ability to hide inside a folder. 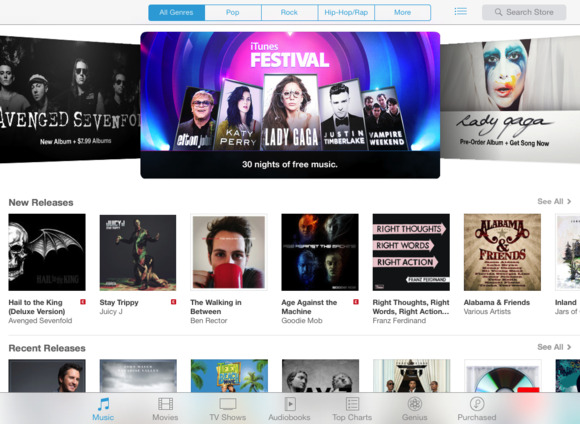 The iTunes app ditches the black and silver headers for flat off-white overlays and blue highlighting; individual sections have more space throughout the app, and flat text, occasionally highlighted in blue, has replaced iOS 6’s buttons. 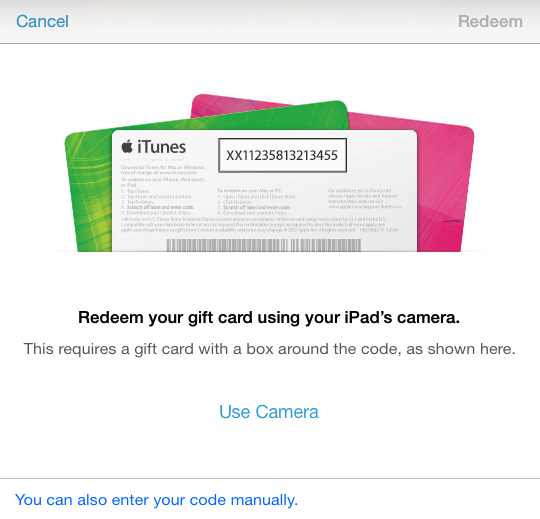 Both iTunes and the App Store apps also allow you to redeem gift cards by scanning the barcode on the back with your back camera. In addition to getting the same design treatment as the iTunes app, the App Store sees the replacement of the Genius tab with the Near Me tab, the addition of a Wish List feature, a new Kids category, and automatic app updates. 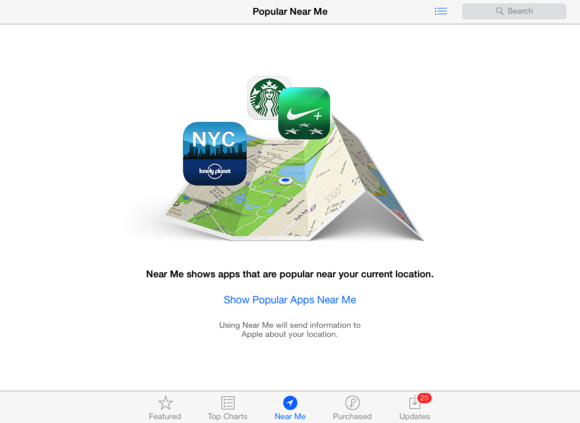 Near Me: Where Genius used your past app download history to recommend programs you might like, the Near Me tab goes a step further, combining your Genius data with a geolocation survey of iOS app buyers in your area. The Near Me tab displays apps that users near you have purchased. Unlike iOS 6’s Genius tab, it doesn’t allow you to indicate you’re “not interested” in an app that doesn’t strike your fancy, but it’s easy to scroll through the list and avoid apps that don’t intrigue you. You can also periodically refresh this list by swiping down and activating the update spinner. 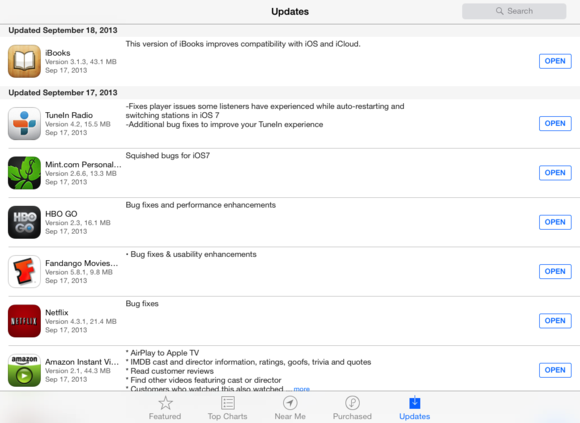 Even if you turn on automatic updates, you can still see release notes in the Updates tab. If you’re really opposed to automatic updates, you can go to Settings > iTunes & App Store and disable the Updates toggle under Automatic Downloads, but we recommend keeping them active so your update schedule is hassle free. The App Store’s Updates tab sees a slight reorganization thanks to this new feature: Instead of showing a list of updates to your apps, it displays a list of any pending patches—apps might appear here if you’re only on cellular data, or if you need to enter a different Apple ID password to download them—along with a dated list of past updates and their release notes. That way, you can see which of your programs has been updated recently, what version you currently have, and release notes (if any). 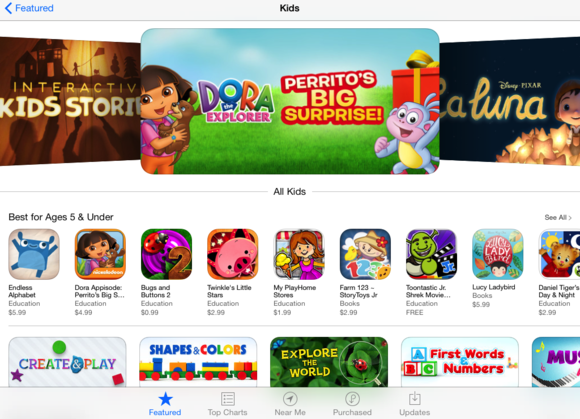 Kids and Wish Lists: The final two App Store features are small but useful. First, if you have children you need to amuse, the new Kids category (go to the Featured tab and tap Categories) showcases all the best programs and games for young ones, sorted by age. Looking for apps for your children? The Kids category might be able to help you out. The Wish List feature is a long-standing feature of the iTunes Store on the Mac, but hasn’t appeared on iOS until now: It allows you to keep a list of interesting iOS apps that you want to purchase, but not at the moment. To add an app to the list, visit it within the App Store and tap the Share button, and then tap Add to Wish List. Your list persists indefinitely, and you can view or edit it at any time by tapping the List button while in the App Store, and then tapping Edit (if need be). In iOS 7, Newsstand looks much more like a traditional app than a specialized folder, though it still runs on the home screen—you can’t launch Newsstand from the search bar, it doesn’t appear in the multitasking view as its own separate app, and you can’t close it on the iPad with a multitasking gesture—only a Home button press. Those who don’t read digital magazine or newspaper apps, however, will be thrilled to know that they can now hide Newsstand in a folder. Newsstand now looks more like an app than a specialized folder. The new Newsstand view takes up the full height of the screen and strips iOS 6’s shelves, opting instead for layers of cool blue gradients, resembling an abstract glass sculpture. Cover icons for each publication sit along gradient lines; you can launch them, as before, by tapping their covers, or delete the app by tapping and holding on it. A small link to the Newsstand section of the App Store sits at the bottom of the screen.